I really wasn’t up to any laborious production tonight either. 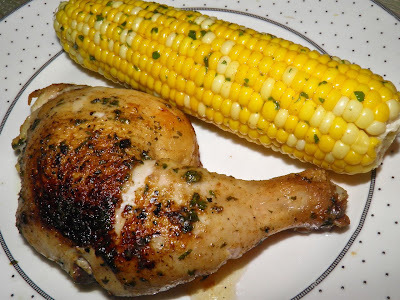 So thank goodness for these two dinner recipes: 30 minute roast chicken and oven roasted corn. 30 minute roast chicken is a godsend. You can be a little bummed out, like me, or you can be in a rush. It works well for either. Minimal effort – just let the oven do its thing. 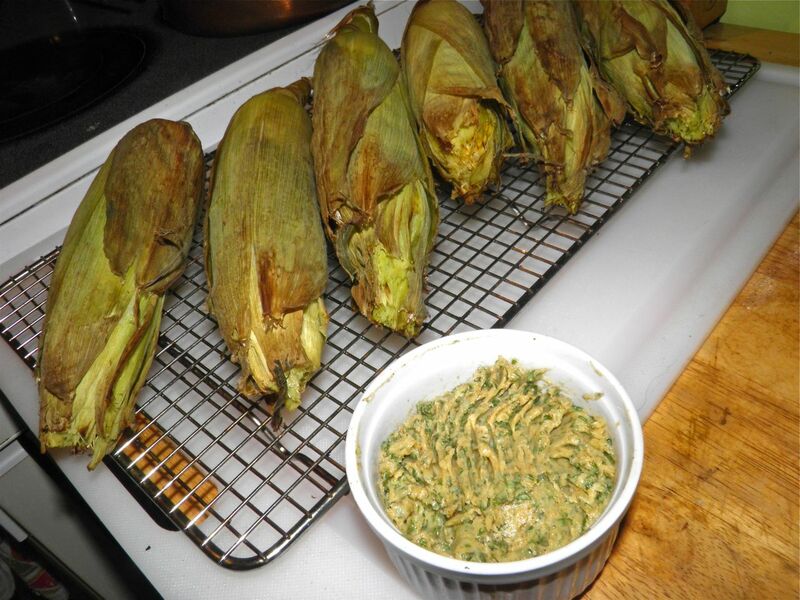 Throwing in the corn for the same length of time is just the icing on the cake. The secret to 30 minute chicken is removing the backbone and flattening it, as well as cutting into the thickest parts (the joints by the bones). This makes the chicken cook perfectly all in the same short time. Compound butter is a great way of introducing flavour to dishes right at the table. All you do is mash together butter, herbs, spices and/or aromatic liquids. Chill – or not – and let it melt on top of your veggies or meat for an instant flavour boost. Delicious. I’ve become quite fond of cilantro cumin butter on corn and I thought there’s no reason on earth why it wouldn’t work as a roasting baste for chicken. And I was right. It does, and very well at that. Hopefully we’ll be able to quickly move forward with the house. I want to move to the country. But in the meantime, it’s comforting how a good meal can begin to brighten your mood. Pan browned, basted and ready for the oven. 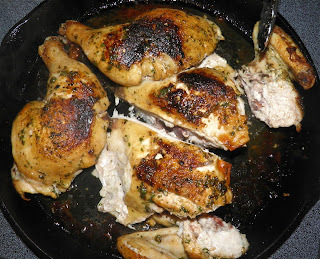 Melt 2 tablespoons of the butter, for brushing the chicken before baking. Using kitchen shears, cut the backbone from the chicken and crack the breastbone so the chicken lays flat. Clip into the meat around the joints partway. Fry bone side down in a sizzling hot pan for 5 minutes, and then skin down for 5 minutes more. 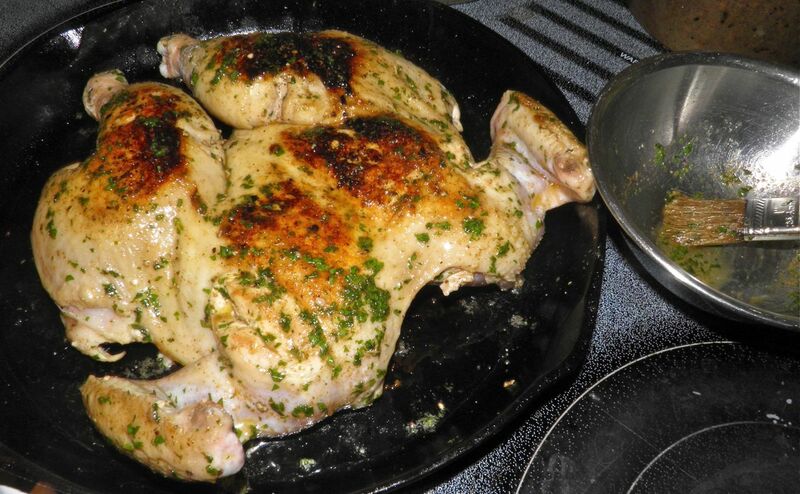 Flip the chicken skin side up, baste with butter and place the pan in the preheated oven. Clip off the tip of the corn husk including the silk and any hanging bits of husk that may burn in the oven. Place directly on the rack in the oven with the chicken. Bake both for 25-30 minutes, or until an instant-read thermometer inserted in the chicken's thigh and breast reads 180°F. The meat will be just cooked and juicy. Round out the meal with crusty rolls warmed in the oven.